AC: No, I don’t know if they always did, or I wasn’t paying attention. I never read anyone’s book. I lived in a world devoid of books, a world of Sportscenter and building cars. People would be like, “you like George Carlin.” I’d be like, “oh, yeah.” “Well you should read his book.” “Oh.” And then I’d go back to the garage. One reason I wrote a book is I’m going to be 47 in a few weeks. I never thought I’d have a book in me, but they come to you. They say, “do you want to write a book?” “How much?” “$200,000.” “Ok.” I didn’t decide anything. Same thing with Dancing with the Stars. It would be like your friend called and said, “I got a free ticket to Maui,” and when you get to Maui, everyone asked you why you went to Maui, and you said “the phone rang.” They offered me money. Now I’m glad that people like it, it’s kind of forever. It’s a least a compilation of your thoughts. ZR: Some people may not know you’re big on home repair and carpentry. 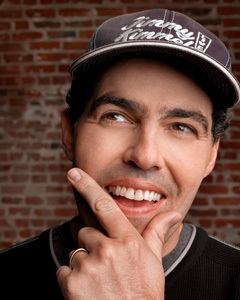 You did the TLC show The Adam Carolla Project and you have the podcast “Ace on the House”. Have you ever thought of writing a home-improvement book too? This interview appeared on the Book Passage blog on June 2, 2011.